This one is definitely a case of “finished is better than perfect.” Today, I finished my doll quilt, made from mini-Tall Shoo Fly blocks. If you would like to make your own mini-version of our Tall Shoo Fly block, here are the measurements you need to cut fabrics for one 3 by 4 inch block (finished size). 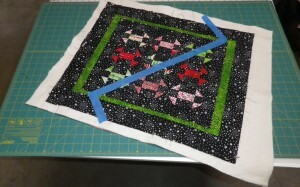 * the 2-inch squares are used to make half-square-triangle units that will finish at 1-inch square. 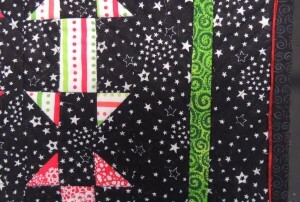 This quilt was made in the same colors as our January blocks, using the (mostly) black and white as the background. 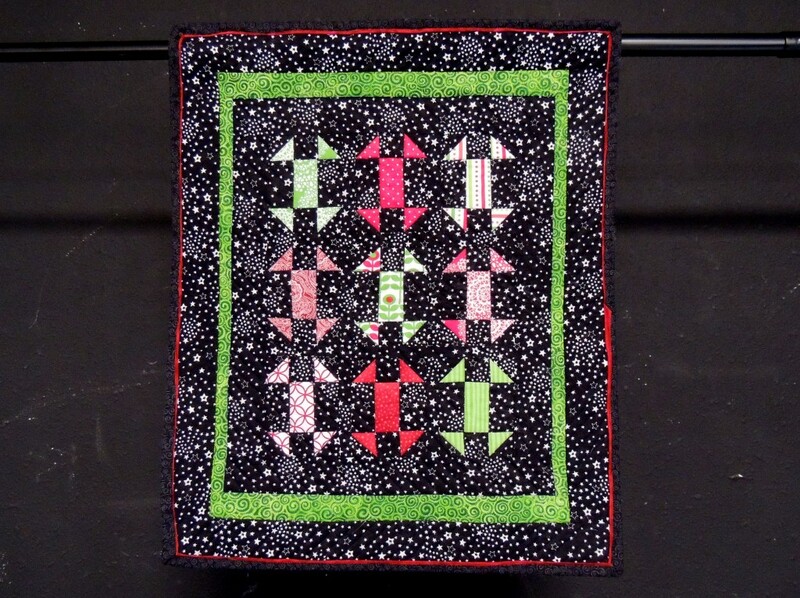 I decided that this busy little quilt needed simple, subtle quilting, so I echo quilted around the shoo flies and the green border and filled in the rest with parallel lines, which change direction in the outer border. I marked the first line with painter’s tape and used the foot of the walking foot to quilt parallel lines, 1/2-inch apart. This is the second time I’ve used the faux-piping binding, with pretty disastrous results … I did mention that it’s a case of finished is better than perfect, right? This is the second time I’ve used the faux-piping binding, with pretty disastrous results … I did mention that it’s a case of finished is better than perfect, right? Here’s a detail of a section that actually looks OK. 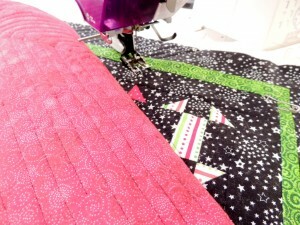 If you look really close, you might even be able to see some of the quilting. 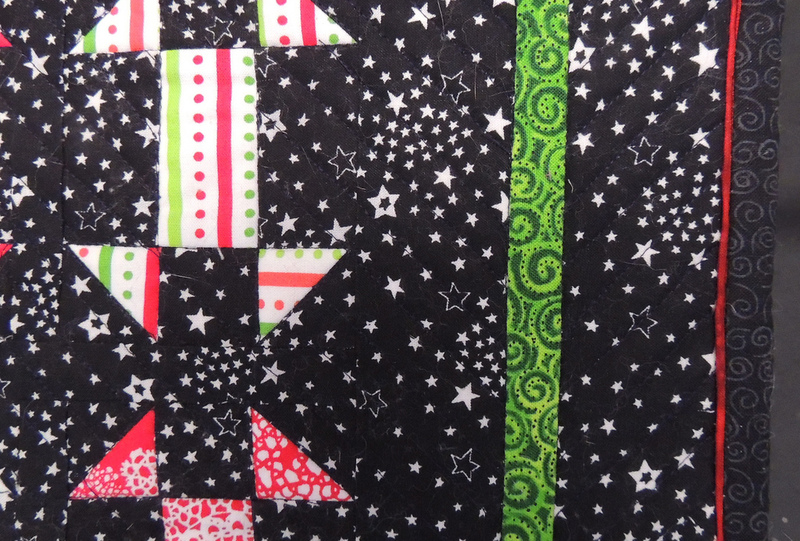 In my little quilt, the sashing between the blocks was cut at 1-inch wide (to finish at 1/2-inch) and the borders were cut at 2 inches (inner border), 1 inch (green on the sides), 1 1/2 inch (green on the top and bottom) and 2-1/2 inches (outer border). It is adorable, and I don’t think I’d have known there were any problems if you hadn’t told us.